The McLaren P1 LM is basically a road-going McLaren P1 GTR, with the same 986 horsepower but with an even huger amount of downforce. Created by the same company that did the original McLaren F1 LMs, Lanzante, it is a ferocious beast. Here it is storming the hill at the Goodwood Festival of Speed, and breaking the record for road-legal cars. 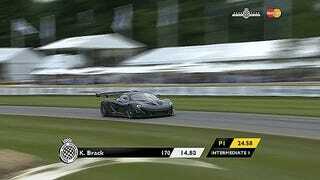 The P1 LM may even be faster, theoretically and depending on the track, than a P1 GTR. It’s got 40 percent more downforce, gold-plated heat shielding in the engine bay, and it’s over 130 pounds have been taken out of the GTR thanks to the removal of racing bits like the air jack system. Even titanium bolts were used, just to save weight. Even the seats are from the more than 20-year-old original McLaren F1 GTR, just for that little extra special touch. The P1 LM has been in gestation for a while now, but it’s only now that we’re finally seeing it. And it’s fitting that Lanzante has performed the modifications – not only did it create the F1 LMs, it’s also the company behind the team that won the 24 Hours of Le Mans in 1995 with a McLaren F1 GTR. McLaren will only sell five P1 LMs. One in gray, like the prototype you see here, and four more in traditional McLaren orange. But I just love the way it dances up that hill. Deputy Editor, Jalopnik. 2002 Lexus IS300 Sportcross.